You’re out with your friends on a Sunday morning, grabbing brunch, and you bite down on your yummy yogurt parfait and all of a sudden you hear a CRACK! You stop for a moment, thinking it was a piece of granola, but then you wiggle your tongue around and then you discover your worst fear, part of your tooth has cracked off. You have a bit of a dental emergency on your hands. The first thing is, DONT PANIC! If you’re not in any type of pain, then that can buy you some time. You may experience some sensitivity to heat or cold. When this happens, Sugar Fix Dental Loft is here to help! us so we can get you in and see what is going on! During your visit, we will take an x-ray and a photo of the break to evaluate the best restoration for you. How does a tooth break? Typically, a fracture of a back tooth is from clenching, grinding, biting the wrong way on something, or decay. With clenching and grinding, this is usually a pattern and we always try to have our patients in a night guard if that is the case afterward! Biting down on something too hard and breaking a cusp of a tooth can happen if you have weaker tooth structure. We always recommend that staying away from things like chewing ice because it causes fractures and breakage. Decay on teeth weakens them and is what we see frequently with breaks. We are programmed now to constantly be thinking of our next move, the “to-do” lists of the day, and we live off of our calendars and emails on our phones. Our brains are constantly in “GO” mode during the day and even when we sleep! We carry this stress in our jaws with clenching and grinding. This then results in worn dentition and broken teeth. Even if you think that you don’t, be conscious of it during the day and you will notice! It really is amazing how natural it becomes a part of your everyday habit and goes unrecognized. A large portion of our patients is recommended to wear one because of their extreme clenching, chipping or breaking teeth. 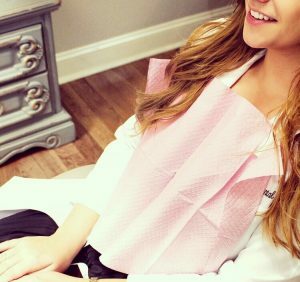 Dr. Jessica Emery and the team at Sugar Fix Dental Loft is always here to help in any way we can. So never be afraid to pick up the phone!